Tadao Sawai began his study of the koto when he was in the 5th grade of elementary school under the instruction of his father who was a shakuhachi player. His progress was rapid, and it was not long before he was performing the complex classical work, Midare. Sawai began writing music for koto when he was in a high school. 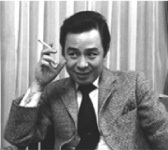 It was during his studies in the Traditional Japanese Music Course at Tokyo National University of Fine Arts and Music, and especially through his graduation performance of Michio Miyagi’s Tegoto, that he came to realize the close relationship between the works of the twentieth century Miyagi and classical koto music. Sawai understood “the power and energy of a single tone” and its importance in traditional Japanese music. After graduation, Sawai made his debut as a professional musician. In 1964, along with Hozan Yamamoto (a current Living National Treasure) and a number of other shakuhachi players, he formed a world music group (Minzoku Ongaku no Kai) to perform new works for traditional instruments. At the same time he worked aggressively to expand koto into other areas, through performances of popular tunes, jazz standards and western classical music. This was a fresh approach, based on Sawai’s sense of the need for music accessible to all and in step with modern times. From the late 1970s Sawai’s vision expanded across the oceans. He was part of a music festival in Paris in 1978, under the direction of composer Toru Takemitsu, and intent on introducing the koto and its music to people throughout the world, he performed widely in Europe, America and Asia. In 1979, along with his wife Kazue, Sawai founded the Sawai Koto Institute and formed the Sawai Tadao Ensemble, to provide better opportunities for Japanese to enjoy traditional music and to foster young musicians and instructors. An extensive series of study sessions focused on the classical repertory and major campaign to boost the dwindling number of koto players in Japan are just a few of his many activities. In recognition of his major contributions to the world of traditional Japanese music, Sawai received three Art Festival Prizes from the Agency for Cultural Affairs, the Matsuo Entertainment Award, and the Kenzo Nakajima Music Award. “The main issue is how to develop a modern music for traditional Japanese instruments. We have no work for koto that acts as a bridge between Michio Miyagi and avant-garde modern Japanese music. There is nothing now to fill the gap between them. It is my wish to thoroughly study composition while digging deep into the classics. Through this process I hope to create a musical world of my own,” he said. Sawai died at the age of 59, leaving more than 100 music records and CDs, and more than 90 compositions. His works are played widely by musicians of all different styles and schools of koto. Aside from the concert stage, a number of them have become standards at performance competitions for Japanese instruments.